With soaring vaults and resplendent stained glass windows, Gothic architecture attempted to recreate a heavenly environment on earth. Elaborating on Romanesque styles, Gothic builders, beginning in the 12th century, further developed the use of flying buttresses and decorative tracery between stained glass windows thus creating interior spaces that dwarfed worshippers and dazzled their senses. Additionally, in response to a new interest in humanism, architectural and portable sculpture primarily depicted figures that acquired more naturalistic and sensuous features than had previously existed in the Middle Ages. Wealthy noblemen commissioned sumptuous manuscript illuminations, and toward the end of the Gothic era in the 14th century, elaborate altarpieces and frescoes became more common in churches and chapels. Renaissance artists and writers in the 16th century coined the term Gothic, and the early art historian Giorgio Vasari infamously reinforced the unfavorable connotations when he referred to Gothic art as “monstrous and barbaric” since it did not conform to classical ideals. It was not until the mid-1700s with the Gothic Revival in England that the style shed its negative associations. Subsequently Gothic architecture in particular inspired new churches in the 19th century, city buildings, and university architecture well into the 20th century. The innovations of Gothic architecture were premised on the ideas developed by Abbot Suger that earthly light contained divine light and that the physical edifice of the church needed to make this concept tangible. Revolutionary transformations of flying buttresses and groin vaulting allowed the inclusion of more stained glass windows in the church’s structure, thus transforming the everyday sunlight into a prism of colors that danced over the surfaces of the stone and reminded worshippers of God’s divine presence. A renewed interest in humanism, which had a slightly different cast than the later humanism of the Renaissance, led to more naturalistic figurative sculpture that decorated the exterior of the churches and housed sacred relics, which were increasingly important to a city’s reputation. In particular, representations of the Virgin Mary and Christ child move away from massive frontal poses to more typical, or everyday, poses that register the tender human emotion one often sees between mother and child. Combining aspects of Byzantine and Romanesque styles and even borrowing from Islamic architecture, Gothic art and architecture revel in its eclectic roots, growing and morphing to suit regional tastes and tendencies. By the end of the Middle Ages, the Gothic style had become “international” in its spread across Europe, and its emphasis on naturalism sparked the revolution in painting that flourished during the Renaissance even if its architecture was replaced with straighter lines and classical proportions. City-states and feudal kingdoms dotted Europe, and the power of the Catholic church continued to grow during the Gothic era. With increasing prosperity and more stable governments, cultural changes included the early formations of universities, like the University of Paris in 1150, and the proliferation of Catholic orders, like the Franciscan and Dominicans. The monks and theologians ushered in a new humanism that sought to reconcile Platonic ideals and Church theology. The humanism at this time saw man as part of a complex hierarchy, divinely ordered by God whose ultimate nature surpassed reason. Called “the high point of French Gothic art” by UNESCO, which designated Chartres cathedral a World Heritage Site, two spires dominate the Western façade; the spire on the right was completed about 1160, while the one on the left combines the original, lower tower with a spire in the Flamboyant style from the early 1500s. Together, the two towers create a dynamic vertical movement, echoed by the pointed arches of the openings and the three protruding columns ascending most of the length of the towers. The cathedral is harmoniously composed of thirds, reflecting the Holy Trinity (Father, Son, and Holy Spirit); the three horizontal levels of the façade are clearly delineated, and three windows above the entrance echo the three portals. As a result, the cathedral powerfully conveys a sense of earthly power that is both grounded and soars upward. 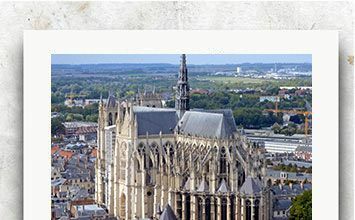 The cathedral, situated on the tallest hill in the city of Chartres, dominates the view of the city, reflecting its importance not only as the center of religious life but also as a hub of economic and social life in its functions as a market place and a site for local fairs and festivals. As earlier buildings were destroyed in fires, the cathedral is the fifth church to be built on the site, a noted place of pilgrimage that was believed to house the Sancta Camisa, a garment that the Virgin Mary wore when she gave birth to Christ. This stone sculpture known as the Bamberg Rider depicts a crowned but unarmed man, seated on a horse, turning to look at the viewer. A convincing naturalism, portraying the subject with realistic proportions and details, pervades the life-sized work, as the horse holds its head with the bit in its teeth, and its left, rear leg flexes as if restless. The man’s fashionable curls and dress indicate an aristocratic background, and his figure conveys a confident calmness as he surveys the distance, while tugging on a strap to draw his cloak around his shoulders. Scholars have debated the identity of the man, believing he may be a specific king known for saintly qualities, and several candidates have been suggested, from Saint Stephen I of Hungary to Emperor Henry II or Emperor Frederick II. Other scholars have argued that the figure may be Christ as depicted in the Book of Revelation, and the city rendered in stone framing the rider’s head as symbolic of heavenly Jerusalem. Originally the work was painted, though only traces remain. The life-sized work was remarkably innovative, being the first monumental equestrian statue since Roman times. The work has had a long cultural life in Germany, as the image was often displayed in public buildings, schools, and private homes. The mystery of the horseman’s identity enabled the work to become an often-evoked symbol, the meaning of the figure interpreted according to the cultural and political environment. This group of four figures found on the west portal of Reims Cathedral depicts the Annunciation and the Visitation of the Virgin Mary. The pair on the left depicts the smiling archangel Gabriel turning toward the Virgin Mary to tell her she will bear the son of God; Mary, who looks pensively downward, turns slightly toward the angel as if quietly listening. The Visitation, on the right, includes Mary, pregnant with Jesus, and her older cousin St. Elizabeth, pregnant with John the Baptist. Each of the figures conveys a sense of movement, as if they were engaged in conversation, their faces conveying subtle emotion, their draperies flowing realistically around them, and a touch of contrapposto can be seen, particularly in Elizabeth’s bent right knee. The innovative figures are no longer emerging from pillars, as they were in the Romanesque and Early Gothic styles, but are fully realized sculptures, three-dimensional as if standing in front of the column-lined church. Because the work is anonymous like most Gothic era work, it’s not known if the same sculptor made all four figures, but the slender gracefulness of the two on the left compared with the more realistic depictions of the two on the right suggest that two different artists might be responsible. For worshippers of the day, they were convincingly life-like depictions of sacred figures, but as works of art the sculptures exemplify the High Gothic style while pointing the way to the later International Gothic style and the Renaissance. This iconic rose window, resplendent with rich color that makes it a masterwork of Gothic stained glass, depicts the Madonna and Child at its center. They are surrounded by twelve panels, radiating like the petals of a flower and depicting doves representing the gifts of the spirit and angels holding candles. In the next ring, 12 square windows placed at various angles show the Old Testament Kings of Judah, while small quatrefoils bear the fleur-de-lis, the symbol of France. The outer ring’s half circles show the Old Testament prophets, while just below the rose window, four lancet windows on either side carry the insignia of the kingdoms of France in blue and gold and of Castile in red and gold, noting the window’s patron, Queen Blanche of Castile. Five lancet windows below depict King Melchizedek, King David, the Virgin Mary as a child being held by St. Anne, her mother, in the center, and King Solomon and the high priest Aaron. These figures are portrayed as standing upon a defeated enemy; for instance, a vignette below King David’s feet depicts King Saul committing suicide. As most worshippers were illiterate, stained glass windows played a didactic role, illustrating stories of the Bible and conveying moral meaning. Iconography played an important role in designing such windows, as the number 12, repeated here, symbolized the unity of the trinity times the number 4 representing mankind. The colors, too, were significant, as blue symbolized the Virgin Mary, whereas red symbolized the suffering and passion of Christ. Many of the church’s 176 windows used predominantly this distinctive shade of blue, named the “bleu de Chartres.” The rose was considered to be a symbol of perfect love as well as the “eye of God,” announcing God’s illuminating presence among men. The light, ever changing, radiated through the depths of the cathedral, creating an inspiring otherworldly effect, while the image reflected the sustaining presence of the Virgin Mary as comforting mother to Catholic worshippers of the era. Cimabue depicts the Madonna and Child enthroned in Heaven, seated upon an intricate gold throne that also suggests the architecture of Heaven, with its tower-like pillars. The two are flanked by angels, arranged symmetrically on either side, their hands holding the towers as if supporting them, while the faces of the first pair turn to the side, and the others above them turn toward the Virgin. Their wings create an overlapping pattern of color gradations illuminated by gold that both encloses and emphasizes the Madonna while leading the eye upward to her gaze at the apex of the triangle. Below, four prophets look out through a trio of arches, conveying the authority of tradition. This Late Gothic fresco depicts the mourning of Christ, as he is cradled by his mother who looks closely into his face, while Mary Magdalene holds his feet, and other shrouded mourners surround him. To the right, two apostles stand beside a stone wall that creates a diagonal that separates the human scene from the blue sky, where a multitude of angels flies, their wings and postures conveying divine distress. Other disciples stand at the left, one bending forward, the other with his face in his hands. Giotto’s masterful composition keeps the viewer focused on the dead Christ’s face and the interaction between him and Mary while at the same time creating a radical sense of space in a rather shallow setting. Giotto depicts two disciples in the foreground with their backs to the viewer, and the central figures to the right with bent backs rise to the disciple who flings his arms behind him in a state of grief. He points to the group of mourners on the other side, unifying the crowd. The circular group of people emphasizes Christ’s horizontal body, and the radically foreshortened angels in the sky echo the earthly circular formation below. The artist’s treatment of human emotion is realistic and powerful, as body language and facial expression convey both the outcry of anguish and the stolid presence of grief. This innovative sense of composition and a sculptural approach to the human figure, conveying gravity and weight, made Giotto’s work both the pinnacle of Late Gothic work and an important influence upon the Renaissance. The central panel depicts the Annunciation, when archangel Gabriel, carrying an olive branch, kneels before Mary, darkly robed on the right, and informs her that she will give birth to the son of God. Between them, a vase containing lilies, symbolizing purity, sits on the floor, while above in the central arch, a group of angels appears, their wings interlocking in a mandorla. The words “Hail, Mary, full of grace, the Lord is with thee” in Latin are embossed in gold, extending diagonally from the angel’s open lips toward Mary. Exquisite detailing, as seen in the angels’ wings and the decorative motif of the chair where Mary sits, give the work a sense of precise and elegant refinement. The central panel is considered one of Martini’s masterworks, showing his innovative use of line combined with a sense of movement and human expression. The angel’s gown flares behind him as if he has just landed, and the Virgin seems to recoil, her face disbelieving at his announcement. Though the setting, employing extensive gold, and subject reflect Byzantine tradition, the portrayal of the Annunciation as a dramatic moment was unique in its time. The prodigious use of gold leaf, lapis lazuli, and expensive lacquer, indicate the high status of this altarpiece, commissioned by the Cathedral of Siena, and dedicated to the city’s patron saints. Some scholars credit Lippo Memmi with the depiction of St. Margaret, on the far right, though other scholars also attribute to him the portrayals of St. Ansanus on the left and the prophets, Jeremiah, Ezekiel, Isaiah, and Daniel, in the tondos, or circular paintings. However, Memmi’s depictions lack the sophistication of Martini’s approach. In this view of the hexagonally shaped Well of Moses, one sees two of the six figures that surround the monumental edifice. The biblical King David, holding a scroll in his left hand, is visible at the left, while the Prophet Jeremiah, holding up a large book from which a scroll unfurls, is pictured on the right. Standing atop thin columns between the human figures, three angels are partially visible, their flaring wings creating the fount of the well. The fount was meant to convey not only the Well of Moses in Egypt but also the living water of the Christian faith, symbolized in baptism. A kind of sacred history is conveyed in the gathering of these figures, each connected to the word of God through the scrolls that he holds. With its naturalistic human figures, powerfully conveying physical presence and individualized expressions, while denoting courtly elegance in the flowing rhythm of draperies and scrolls, this work innovatively exemplified the International Gothic Style. The Carthusian Monastery in Dijon commissioned the work from the artist who was the court artist for Phillip the Bold of Burgundy. The original structure was more complex, as the center of the well included a pier, carved with prophets and angels, and a cross rising from the depths to tower over the well, but only the well itself has survived. Originally the sculpture was painted and gilded by Jean Malouel, traces of which are visible in the blue bands of David’s robe and Jeremiah’s green sleeve, which would have created a more animated and lively effect. The sculptor has conveyed his subjects’ importance while also depicting their different personalities: David’s sense of strong but relaxed authority and Jeremiah’s pensiveness. Sluter’s innovative three-dimensional and emotionally expressive figures had a noted influence upon Northern European Renaissance artists, including Rogier Van der Weyden, Matthias Grünewald, and Albrecht Dürer.